Every institute has archives. You cannot have a proper Institute with a capital 'I' without them. The 'Institute for the Advancement of Biological Studies on Furaha, Nu Phoenicis IV', also known as the 'Institute of Furahan Biology', or even shorter as the 'IFB', definitely has archives. You might think that the IFB, being a virtual Institute, would have virtual archives, but that is not the case. 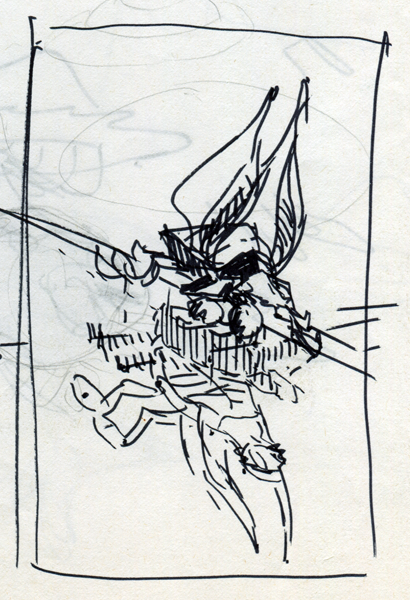 I have a stack of old sketchbooks and loose sheets of paper containing sketches that I have amassed over the years. As archives go, this one is a right mess, as the papers are not in any order and the dates of the sketches and studies are not indicated. 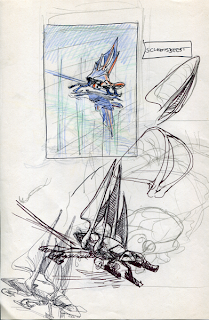 Some sketches contain the earliest appearances of animals that were later painted, others are just doodles, some contains ideas later incorporated into something else, and some show designs that never made it. I thought it might be interesting to show a few of those sketches, and will start with an example of the latter kind, one that nearly made it into a painting, but became destined for non-existence. So here is the world's first peek at the 'schaatsbeest'. This is probably its very first appearance. I must have felt the composition was good from the start, as it hardly changed afterwards. In fact, I still like it. I wrote 'schaatsbeest' next to it, which is Dutch for 'skating beast'. For this post I decided to leave its name in Dutch rather than translate it into English. There are animals names in Swahili and French besides English on Furaha, so why not one or two in other languages? On the remote chance that you might wish to pronounce its name correctly, the 'ch' in the beginning is like the 'ch' in 'Bach' as Germans pronounce it, which is NOT 'bahk'. The 'aa' is like the 'a' in 'father' but longer, and the 'ee' in 'beest' is like the 'ay' in layer (if you think this is silly, remember that you English speakers are the ones who messed things up with your great vowel shift). Anyway, the schaatsbeest is ice sailing, also known as 'ice yachting'. If you do not know what ice yachting is, have a quick look at the Wikipedia entry, or here for photographs of present-day ice sailing. 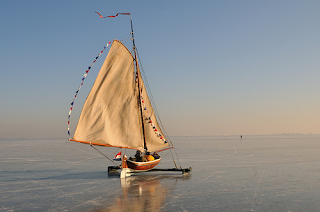 Just to be on the safe side, here is an example of a historical type of ship used in ice yachting. As you can see, the process is like sailing, but instead of a hull making its way through water there are skates allowing it to glide over frozen rivers, ponds or lakes. And this may well have been the second sketch. Together with the first one it allows the beast's anatomy to be discerned: it has six legs, of which four are used to skate on, and the other two look like the front limbs of a mantis (this may very well be the first time that this particular configuration came up). There are four sails, derived from wings. The animal is sailing into the wind, which means that the wind is coming from in front and a bit to the side. This type of sailing requires the sails to be very taut, and results in large sideways forces on the ship, so ships sailing into the wind typically tilt over to the leeward side. The schaatsbeest undergoes the same forces, and in this case the two skating legs on the windward side are tilted right off the ice, where they help act as a counterweight. The point of this second sketch was to work out the perspective. If you look carefully, you will see that the animal throws a shadow on the ice, indicated by vertical stripes, and below that you see its body mirrored in the ice (the perspective of a mirror image is easy, once you understand that you should act as if there is a second object behind the mirror). In this case, the mirror image allows the viewer to see the underside of the animal. I thought that this would make for an interesting composition. This sheet of paper shows more takes on the same idea. 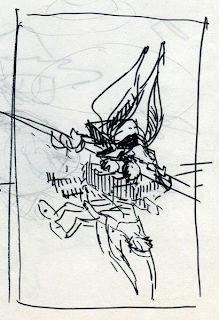 I used to sketch multiple images right through one another at the time. I was playing with the sails and had a first look at colour. The colour sketch at the top shows a completely different kind of sail, reminiscent of a schooner rig. The bottom sketch shows two pairs of sails while the two other sketches show fused sails, with a mainsail at the back and a jib or genoa in front. 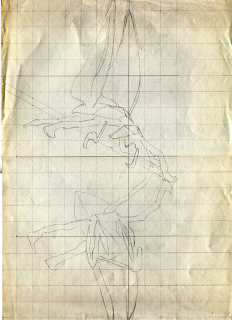 Here is a pencil sketch showing the schaatsbeest from in front. The odd object at the left is a squarish 3D arrow indicating the wind direction. The animal allows its body to be tilted, but uses its front limbs and the windward skates to balance it. Its head is held perfectly horizontally. The sails are also moved towards the vertical. I think that the thick lines where its back meets the mainsail masts were alterations to allow it do that with sufficient force. The small sketch towards the right show it sailing squarely before the wind, where it does not tilt and spreads out its four sails to make the most of the wind. Finally, a very large pencil sketch. It looks like it is drawn on parchment, but that is only because I needed to manipulate the image for the pencil lines to show up at all. I had made a cardboard model, put it on a mirror, and based the sketch on that. 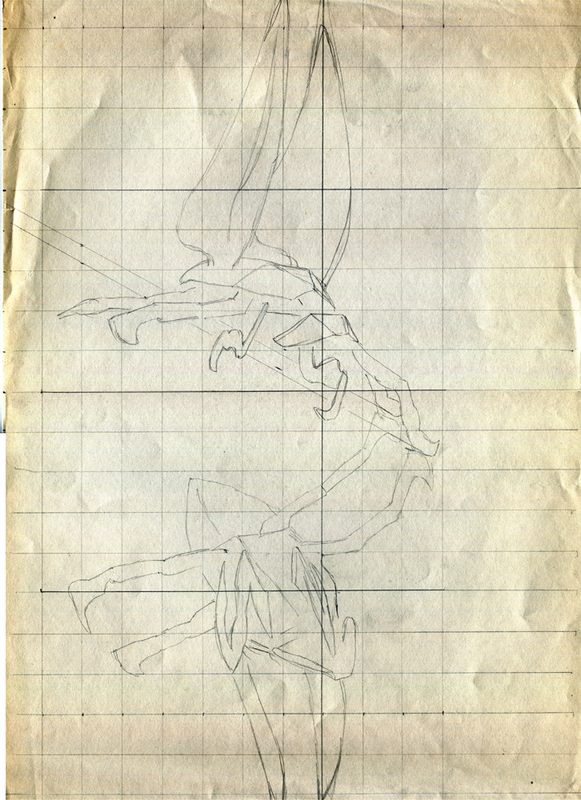 That explains the thinness of the limbs and the lack of any perspective drawing guides. I stopped development there. In hindsight, I may have been right to do so. While I still like the composition, almost enough to pick up the design again, an ecological point of view suggests this animal to be in trouble. It is obviously quite well adapted to move around on expanses of flat ice. Are these then around from most of the year? What does it find there to eat? 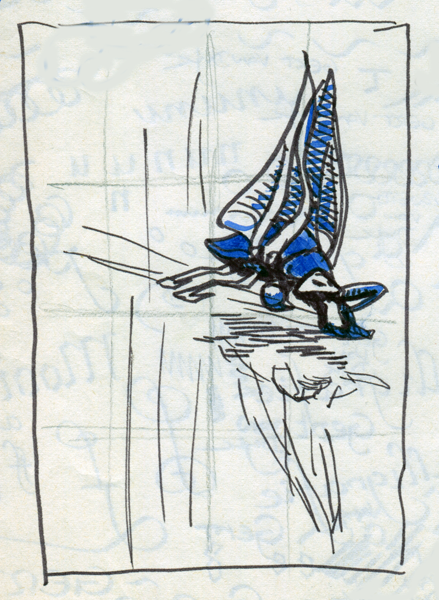 The animal would probably be very clumsy on dry land, and its modified wings will not allow it to fly. Oh well; back into the archives, I guess. On Earth, only soaring birds like vultures are energy efficient enough to be specialist scavengers. Since the poles are obviously devoid of thermals, perhaps the ice runner's similarly energy efficient mode of locomotion has allowed it to step into the scavenging niche, like a more specialized arctic fox. Incidentally, this post has made me curious about the polar ecosystem on Furaha. Are there blubber-insulated fishes V in place of seals? Giant hexapod carnivores in place of polar bears? I hardly explored polar biotopes on Furaha, so there aren't any snow sailers. Unlike Evan did with his Nereus project, I never sat down to work it out from the start. Perhaps I should have, but as it is, the Furaha project offers glimpses of life here and there, but not a comprehensive survey. Among the sketches there is at least one of a very large and very bloated hexapod stepping onto a frozen lake, though. At present the only fully worked-out animal with adaptations to a cold environment is the woolly-haired shuffler. The wings of the schaatsbeest's ancestors either derived from novel formations of the skin/carapax, or from originally 'biramous' limbs. In this sense their body plan is a bit like that of Earth arthropods. There is at least one flying animal of this nature on a painting. This post made me imagine a spider-like creature spinning a silken kite and using it to sail across it's icy environment ( look up "snow kiting" ). What do you think? The concept of sailing has real-world precedent, and I think that a land-based sailor is particularly interesting. I might be wrong, but the sails seem a little small. What kind of speeds can these guys reach? About the food: a possible source is ice algae. The schaatsbeest could zip along on the ice until it comes upon a patch on which to graze. Depending on the size of the creature (which is hard for me to pinpoint from the sketches alone) the creature may have to travel over large distances to find enough to sustain itself. Such an undemanding food and little chance of predation means that the scaatsbeest can focus on its finding that food rather than eluding other creatures. Survival in cold environments is something that many of Earth's life forms do quite well, and I think this one could work too. In short, I guess I'm having a hard time seeing the ecological trouble the schaatsbeest faces. I'd be more worried about thermoregulation. Is the schaatbeest warm or cold-blooded? If it is the latter, it might be able to make it by with a very low metabolism, seeing as it can depend on the wind rather than its own power to move (although it will still need a means to keep its blood from freezing), but if it is the former, the schaatsbeest has no obvious means of insulation (at least, none than I can see) and those sails and widespread legs present a large surface area for heat loss. To that effect these structures could be folded against the body, but they will need to be extended again as soon as the schaatsbeest wishes to move. Are they perhaps composed largely of dead tissue with minimal blood flow and very few blood vessels so as to minimize the drain? I'm not that worried about thermoregulation. It could have a low metabolism as well as proteins that keeps its cells from freezing despite the cold; minimal blood flow would be a good factor as well. It could also hibernate during the really cold seasons, emerging only in the "relatively" warm summer to feed on algae blooms. Animals of the Future? Allons-y!